Through the first 17 days of the 2015-16 college basketball season, the effects of rule changes this summer are becoming more clear. The pace of play is faster. It is more difficult to defend. Scoring is up. 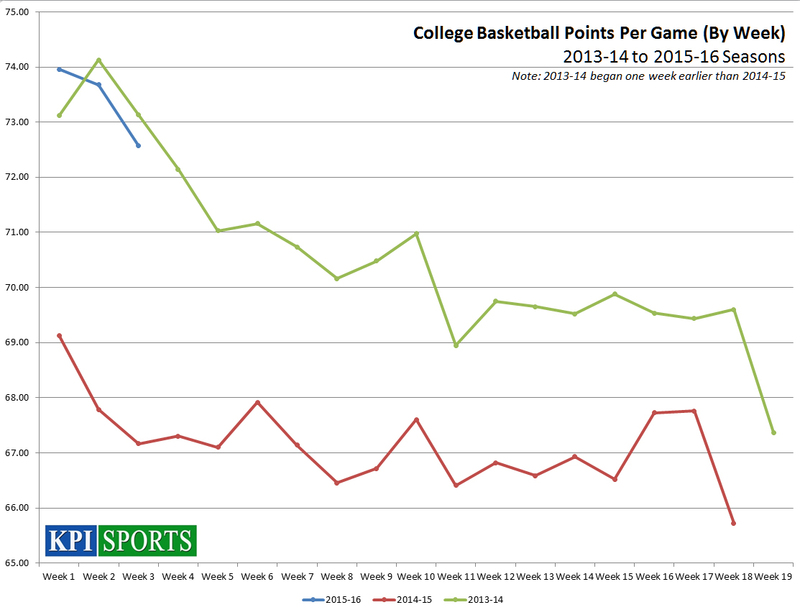 Scoring is up 5.46 points per team, per game over 2014-15 (up 8.0%), yet up only 2.5% points per possession. 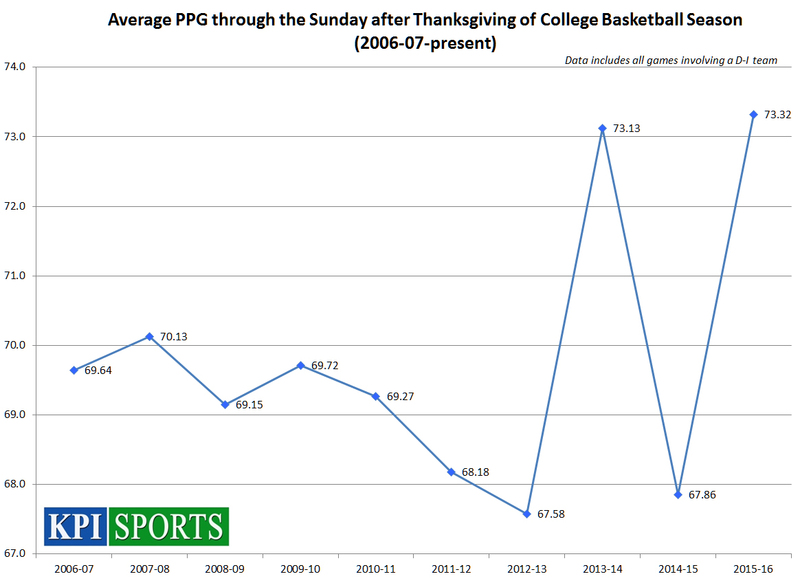 Scoring is slightly higher than the 73.1 points per game teams averaged through the Sunday after Thanksgiving in 2013-14. Possessions are up 3.70 per team, per game (up 5.4%) from 2014-15 to 2015-16. The average length of a possession is 16.84 seconds (down from 17.76 seconds per possession in 2014-15). 68% of the scoring increase can be attributed to the increased pace of play. 32% is attributable to increased offensive efficiency (points per possession). FGA (up 6.5%), 3-ptA (up 10.6%), and free throw attempts (up 5.9%) are all up. FGA and FTA are up only slightly on a per possession basis (up 1.0% and 0.4% respectively) while 3-ptA per possession are up 4.9% per possession. Slightly more 3’s are being attempted. 35.5% of all shots are 3’s this year, up from 34.2% of shots in 2014-15 and 32.7% of shots in 2013-14. 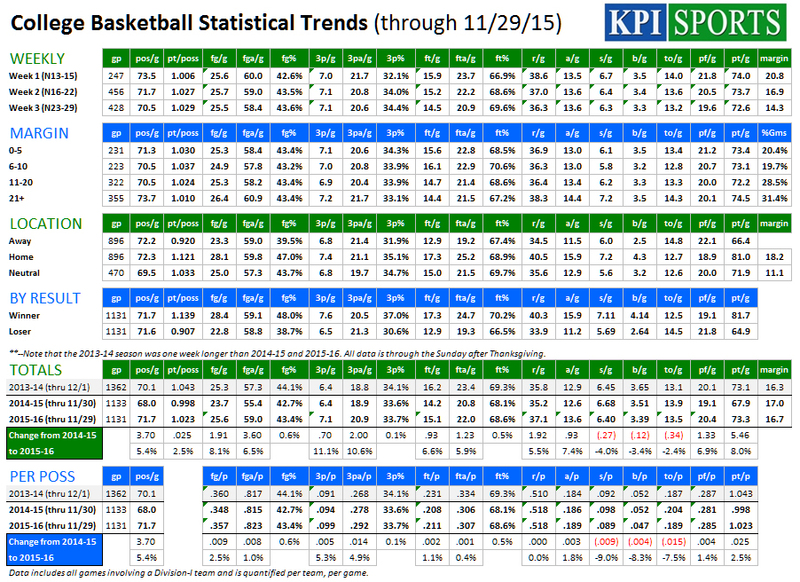 Steals, blocked shots, and turnovers are all down despite possessions trending up. This may indicate that there is more “freedom of movement” in the game. Fouls are up 1.33 per team, per game (up 6.9%) and are up 1.4% per possession. 1.08 free throws are attempted for each foul, down from 1.09 in 2014-15 and 1.16 in 2013-14 (which means a very slight increase in non-shooting fouls). 82.9% of the scoring increase is from made FG’s (44.3% from made 2’s, 38.6% from made 3’s) while 17.1% of the increase is from additional made free throws. The 5.46 PPG increase includes 2.42 PPG from made 2’s (1.21 more made 2’s), 2.11 PPG from made 3’s (0.70 more made 3’s per game), and 0.93 more made free throws. In 2015-16, 50.5% of points come from made 2’s, 28.9% from made 3’s, and 20.6% from made free throws. In 2014-15, 51.0% of points came from made 2’s through the first three weeks, 28.1% of points from made 3’s, and 20.9% from made free throws. Data includes all games involving a Division I team. All data is per team, per game. The period measured in all seasons is from the start of the season through the Sunday after Thanksgiving (note that the 2013-14 season was one week longer as a result).